This looks funny, thought I'd share it. TAKE MY NOSE... PLEASE! is the acclaimed film, directed by the 89 year-old first time filmmaker Joan Kron (former editor at Allure Magazine for over 25 years and at New York Magazine), is a comedic point of view on women and plastic surgery, as told by female comedians including Jackie Hoffman, Emily Askin, Judy Gold, Julie Halston, Lisa Lampanelli, Kathy Griffin, Margaret Cho, Giulia Rozzi and many others. The Orchard will release this award winning documentary film on VOD and all digital platforms on January 9, 2018 - coinciding with the week of filmmaker Kron's 90th Birthday! TAKE MY NOSE… PLEASE! has played a number of film festivals across the nation before hitting theaters this October including the Newport Beach Film Festival, Martha’s Vineyard Film Festival, San Francisco Doc Fest and others. The film picked up an Audience Award at the Miami International Film Festival where it premiered in February, and again recently at the Berkshire Film Festival. TAKE MY NOSE… PLEASE! follows two comedians as they deliberate about going under the knife. 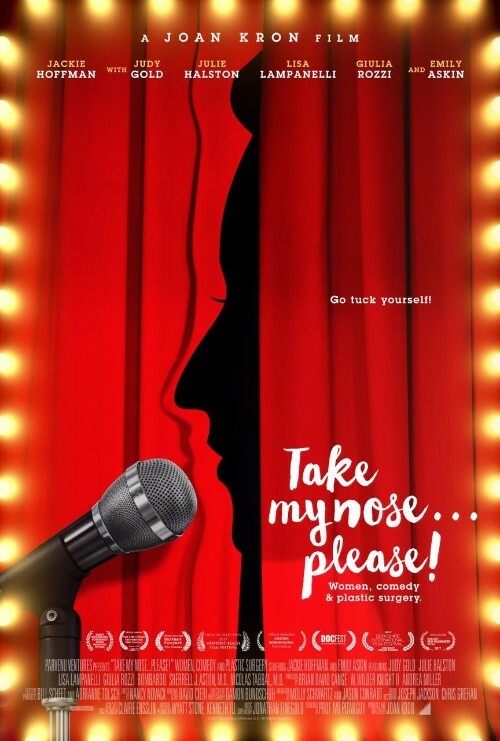 Emily Askin, an up-and coming improv performer, has always wanted her nose refined. Jackie Hoffman, a seasoned headliner on Broadway and on TV, considers herself ugly and regrets not having the nose job offered in her teens. And maybe she’d like a face-lift, as well. As we follow their surprisingly emotional stories, we meet other who have taken the leap - or held out. Putting it all in perspective are psychologists, sociologists, the medical community and cultural critics. And for comic relief and the profundity only comedians can supply. The film includes commentary from Roseanne Barr, Phyllis Diller, Joan Rivers, Judy Gold, Julie Halston, Lisa Lampanelli, Giulia Rozzi, Bill Scheft, and Adrianne Tolsch and others. TAKE MY NOSE… PLEASE! is directed and produced by Joan Kron and edited by Nancy Novack. The film is produced by Brian David Cange and W. Wilder Knight III; with Andrea Miller as consulting producer; and Bill Scheft and Adrianne Tolsch as executive producers. The original score is composed by David Cieri with Damon Bundschuh as the director of photography.